Many women wonder about the relationship between menopause and unwanted facial hair. In fact, at MenopauseRx, approximately 40% of women who have registered with us tell us that unwanted facial hair is one of their frustrations with menopause. Many women who complain of unwanted facial hair also complain of skin changes. Approximately one in four women experience hair thinning. Due to a lack of accurate information many women are misinformed about the progression of thinning hair. In general, as healthy women age, their hair becomes thinner. Most women will lose 40-100 hairs per day. The texture of hair is a combination of the size of each strand, and the overall amount of hairs on your head. Fine, medium and coarse hair are terms used to describe the size of each strand, while thin, normal and thick hair refers to the number of hairs on the scalp. Many hair experts will use this terminology when describing hair loss. In general, women with fine hair will have a higher chance of hair thinning and loss. Certain conditions such as thyroid problems, pregnancy, medications, diet, or stress can cause hair thinning. The most common type of hair thinning or loss is called androgenetic alopecia. Thirty million women are affected by this condition. It can affect women of all races and can be passed from either mother or father. It usually begins in the twenties and becomes more obvious with age, such that by age 50, 50% of women will notice some degree of hair thinning. Usually hair grows approximately ½ inch per month. With androgenetic alopecia, the hair becomes smaller and the growth phase of the hair is reduced resulting in shortened and thinner hair. Other types of hair loss include alocpecia areata and telogen effluvium. Alopecia areata is an immune system disorder that causes the hair follicles to stop producing hair and results in patchy hair loss. Telogen effluvium results in thinning that begins abruptly and is associated with a significant stress or illness. Women often notice telogen effluvium during the post-partum period, where thinning hair is likely to occur as a result of the stress of childbirth. It is usually reversed after 6-8 months. What are the Treatments for Hair Loss in Women? Fortunately, there are many options for treating hair loss in women. Minoxidil (2% topical solution) to reverse the thinning process and help stimulate hair growth. Minoxidil is an FDA approved treatment for female hair thinning and is the active ingredient in a number of over the counter treatments, such as Rogaine® for Women. In clinical studies, dermatologists reported that almost 2 out of 3 women who used Rogaine® For Women were re-growing hair at 8 months. Minoxidil works by increasing the growth phase of the hair cycle, allowing hair to grow longer and inactive hair follicles to become active. In general, if used daily results are seen within 4 months of use. Side effects to Minoxidil are few and include itching and irritation of the scalp. Some women will notice fine facial hair on the cheeks and above the eyebrows. Minoxidil will not alter the way a women styles and cares for her hair and can be used to maintain your hair while making it thicker and fuller. Lastly, Minoxidil needs to be used continuously to maintain the hair that has re-grown. A wig or hairpiece. A good wig can be styled to look like your natural hair before thinning occurred. The most common complaint about wigs is the difficulty in maintaining the style and look. They can be made from natural or artificial hair. Hair transplant surgery. This operation actually replaces hair in a natural pattern. Multiple techniques are used including grafting, hair plugs, or scalp revisions. Most transplant surgery is expensive and requires qualified and experienced practitioners for the best results. What are the causes of Unwanted Facial Hair? 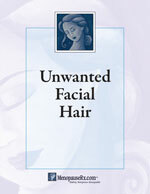 It has been estimated that more than 40 million American women in the United States have unwanted facial hair. Like menopause, the story of unwanted facial hair is often all about estrogen, or to be more precise, the relationship between levels of estrogen and testosterone. When estrogen predominates, a woman’s face typically has vellus hair –fine, short and almost invisible like ‘peach fuzz’. Men, in contrast, have terminal hair, the longer, coarser, darker beard-type hair. Unwanted facial hair can be different for every woman, from a few hairs on the chin, light growth on the upper lip or heavy and beard like growth. One woman may find the slightest growth on her lip or chin terribly bothersome, while another woman may have visible hair on her upper lip and it may not bother her at all. Women with excessive facial hair often experience psychological factors such as low self-esteem and embarrassment. The key hormone that controls the type of hair on your face is dihydrotestosterone (DHT). Higher DHT levels cause your facial hair to convert from vellus to terminal hair production. During reproductive years, the higher relative levels of estrogen to testosterone usually keep production of DHT low. However, as menopause approaches and estrogen levels drop, there’s an increase of DHT in the hair follicle (details below). It’s at this point many women begin to see frustrating ‘beard-like’ hairs in places they’ve never seen them before—chin, jaw line, cheeks, and even the forehead. At MenopauseRx, approximately 40% of women who have registered with us tell us that unwanted facial hair is a frustration. So, if you’re facing excess facial hair, you’re far from being alone. Over the years, good choices for solving the problem have been fairly limited. If there’s just a bit of facial hair showing up, the common response is to control the problem by plucking with tweezers or with some gadget or contraption that tweezes automatically. The problem with that, however, is that plucking actually can stimulate the hair follicle into an active growth (anagen) phase in which hair growth is quicker and thicker…something you obviously don’t want. Choices beyond plucking have their limitations as well. Shaving leaves a bristle and 5 o’clock shadow, and is something you have to actively keep up with once you’re committed. Electrolysis is expensive and painful. Laser is expensive and can be uncomfortable. We all know how painful waxing can be. Plus the cost adds up over time. The list of frustrations with current treatment can be pretty long. It is important to talk to your doctor about unexpected or rapid unwanted hair growth. What are the Treatments for Unwanted Facial Hair? A number of options for treatment of Unwanted Facial Hair have commonly been used, including: Tweezing, Shaving, Bleaching, Depillatories, Waxing, Electrolysis and Laser. Reductase-5, a new product recently introduced by Trienelle Skincare. It’s a gentle lotion that you apply to the face twice a day, just like you would your daily moisturizer. The natural and nutritive ingredients are excellent for your skin…and, over time, your face hair problem fades away. What’s fascinating is how it works. Trienelle has found a way to deal with the DHT problem, helping the hair follicle return back to normal vellus (fine, short, and barely noticeable) hair production. DHT in the follicle comes from testosterone. There’s an enzyme in the hair follicle called 5-alpha reductase and it is responsible for making testosterone into DHT. Trienelle developed a way to slow down that process, so there’s less DHT. With less DHT, hair returns back to the normal vellus hair. Which is lighter, shorter, finer…almost invisible ‘feminine’ hair. Vaniqua, is a prescription cream proven to slow the growth of unwanted facial hair in women. Vaniqa (eflornithine HCl) is a topical solution available by prescription that has been clinically shown to slow the growth of unwanted facial hair in women. When applied to the areas above the lips and on the chin can slow the hair growth significantly in those areas. Women will have to continue to use their normal hair removal system, but over time you will discover that hair removal will become less and less necessary, as the hair growth dramatically slows. Some women experienced mild and temporary skin irritations such as redness, stinging, burning, tingling or rash in clinical studies.